Early childhood educators can play an important role in promoting young children’s oral health. Whether you work in child care, kindergarten or community programs, you will find information below to help you improve oral health in your service and community. Part of this work is with early childhood professionals including child care educators, supported playgroup facilitators, family support workers and early intervention services, to increase knowledge, skills and confidence to promote oral health within their services. Smiles 4 Miles is an oral health promotion initiative implemented in early childhood settings in partnership with local organisations. Inclusion of an oral health program within early childhood settings such as kindergartens, play groups, long day care and family day care contributes significantly to outcomes for children. Have you heard about the Achievement Program? The Achievement Program supports early childhood service to create healthier environments and recognises their work to improve the health and wellbeing of their communities. For more information contact the Healthy Families, Healthy Smiles Team. This is an education program for introducing oral health promotion into Victoria’s three early parenting centres. The program was developed by DHSV and clinical educators from Tweddle Children and Family Health Service, Mercy Health O’Connell Family Centre and the Queen Elizabeth Centre. The program comprises four learning sessions. The Participant’s Workbook provides content and learning activities and the Facilitator’s Guide outlines how each learning session (module) can be facilitated by either clinical educators or staff responsible for quality improvement. The Healthy Eating Advisory Service provides free information, training, menu assessments and support to help early childhood services provide and promote healthy foods and drinks. 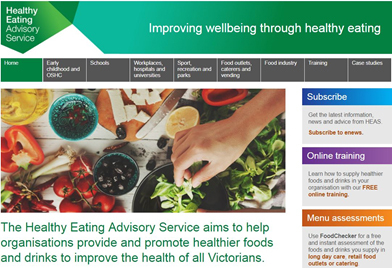 HEAS is run by Nutrition Australia Vic Division, with support from the Victorian Government. A series of inserts for early childhood services to use in newsletters for families to promote key oral health messages. Includes a how to use guide and images. These are just a few suggestions for books that will help you to introduce discussions with children about the importance of teeth and how to look after them.